Look at what Scott Adler aka “The Dadler” on Babycenter’s blog Momformation (where you can find us too!) thinks is cool. He’s our next guest dad blogger in our Dads Dig This series. As if I thought size equated with cool, I’ve populated my life with collections that compete with my children for space in our small house: record albums, books, and typewriters. And anything I can do to make these old things relevant to my modern life I’ll try; I’ve transferred records into MP3s and I read constantly to my kids. But finding a modern application for the typewriters has been tough. That is, until I opened a YouTube link six months ago and saw Jack Zylkin click-clacking away on his USB Typewriter. translate the machine’s manual action onto your computer. 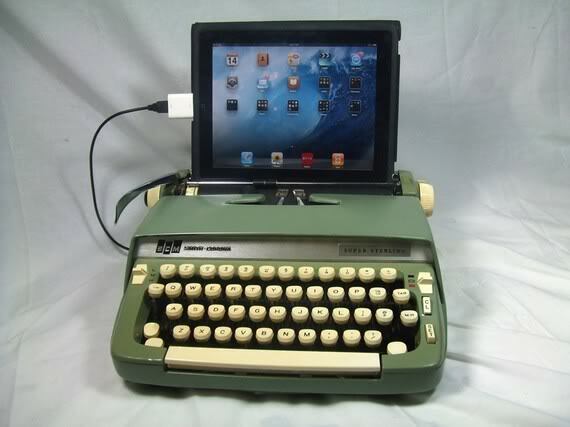 For $69, you can buy a DIY USB typewriter kit from Zylkin (I swear after my kids go to college and I get a free weekend I’m doing this) or you can get a turnkey, ready-to-go typewriter-iPad combo starting at $799. Bring your own typewriter back to life with Zylkin’s DIY USB typewriter kit, or purchase your own at USB Typewriter on Etsy. If my husband reads this blog, it will take a lot to convince him that I didn’t write it. The only thing missing to the books, album and typewriter collection is my newest item……phonographs. I’ve found my writing is lacking creativity now that I use a computer. Often, I pull out my typewriter and plug away…….feeling that ribbon of creativity begin to flow through me.